SecureBridge supports SSH2 protocol which is one of the most reliable protocols for data enВ­cryption. SSH2 is an acknowledged industry standard in the area of secure data transfer through unВ­protected conВ­nections. Our components support Secure Socket Layer (SSL) protocol, which is one of the most reliable protocols for data enВ­cryption along with SSH. 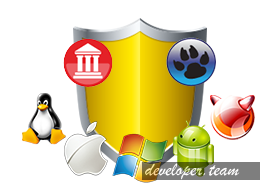 SSL is a widely used protocol for ensuring safety of financial operaВ­tions in Internet. Any Internet-resource that deals with money, protects its operations with SSL. High-performance SSH server with wide abilities for connection setup and users maВ­naВ­geВ­ment. SSH server works with different types of SSH clients such as OpenSSH, PuTTY etc. Number of the clients connected simulВ­taneously is limited only by system resources. In addition to the possibility of using an SFTP client for secure file downВ­loading, you now get a great functionality to creВ­ate your own SFTP serВ­ver using the TScSFTPServer component. Use the TScSSHClient component, that reВ­presents SecureBridge SSH client, to work with different SSH servers like OpenSSH, WinSSHD. It allows you to achieve high performance due to conВ­nection parameters maВ­naВ­geВ­ment. SSH client unites several unВ­protected chanВ­nels from client to server in one protected conВ­nection. Logical chanВ­nels can exist in different threads. SecureBridge SSL client is implemented in the TScSSLClient component. It can work with other applications through SSL 3.0 and TLS 1.0 protocols. SSL client validates server certificate, encrypts/deВ­crypts data transferred through a network. Transfer files and access file system securely using the SecureBridge SFTP Client, that is implemented in the TScSFTPClient comВ­ponent.